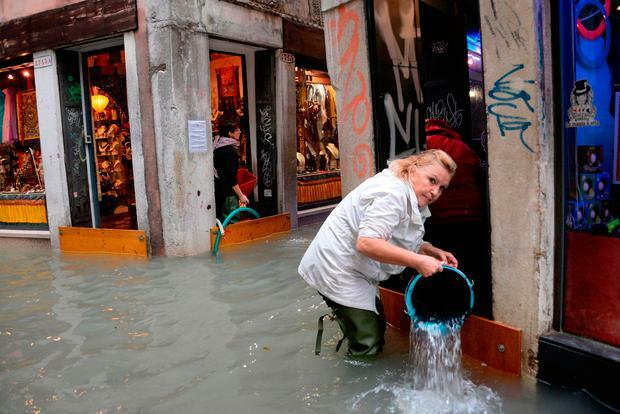 Around three-quarters of the Italian lagoon city of Venice has been flooded after strong winds raised the water level by 156cm before receding, officials said yesterday. Venice frequently floods when high winds push in water from the lagoon, but yesterday's levels were exceptional. The peak level was the highest reached since December 2008, according to Venice statistics. The last time levels topped 160cm, which had been forecast, was in December 1979. Venice Mayor Luigi Brugnaro said a series of underwater barriers being erected in the lagoon, nicknamed Moses, would have prevented the inundation. The project is long overdue, beset by cost overruns and corruption scandals. Veneto regional governor Luca Zaia says flooding could reach the levels of the 1966 flood that struck both Venice and Florence.